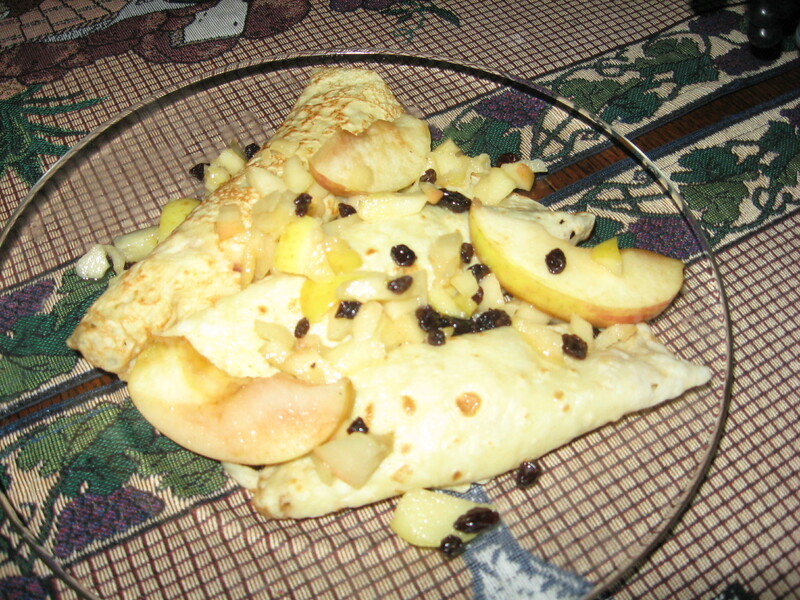 The other night, after dinner, I was still hungry for an easy something yummy and what came to my mind was that so seldom made now-a-day crepe. Not so long ago, you’d see a creperie at almost every corner, but now it’s found mostly at the outdoor craft and art fairs (or at the Lodge & special restaurants). It’s such an easy and quick as a wink dish to make as well as being very versatile. It can be sweet or savory and it can be easy on the belly depending on what ingredients you use. So, here’s a basic recipe that I use and a lot of variable ideas to make it just what you wish. It’s good for any meal as a first or main course or a desert. 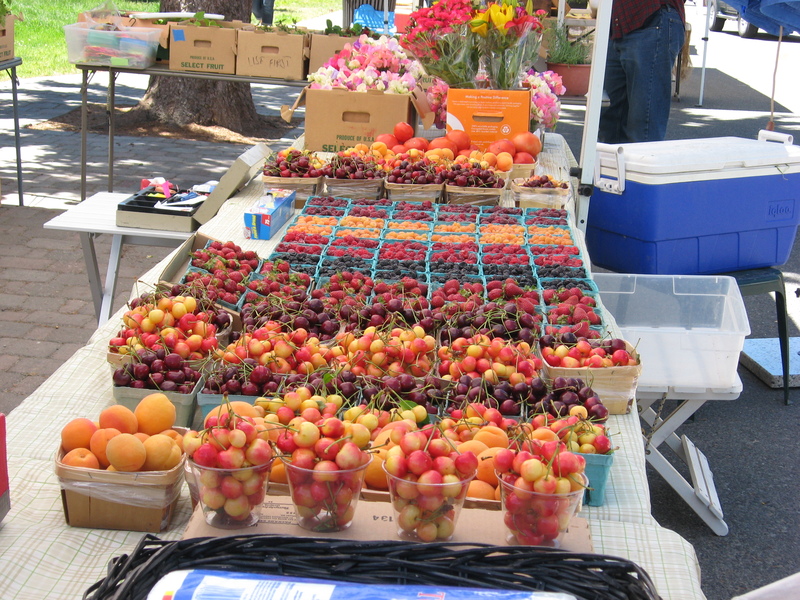 With the summer fresh fruits so beautifully featured at the now open Farmers Markets, you can’t beat pairing them with the crepe—and voila you have a fancy desert with barely any fuss or muss. And don’t forget, most kids love it and can take a hand at cooking it themselves. Sift the dry ingredients in a small bowl. Beat the egg, milk, and water in a separate container with a wire whisk. Add the liquid to the dry ingredients with a couple of swift strokes of the whisk. Don’t beat too much. It’s OK to leave some little lumps in the batter. Heat the skillet to the point where when you splatter a couple of water drops in it, the drops will scatter about before disappearing. Reduce the heat just a bit and then either place a little butter, spray oil, or nothing if you prefer and the pan is non-stick, and place about 2 Tblsp. of batter in the skillet. Tip the skillet all around quickly to get all of the liquid to the outer edges and let cook till bubbles rise and the top seems fairly dry—about one minute or less. 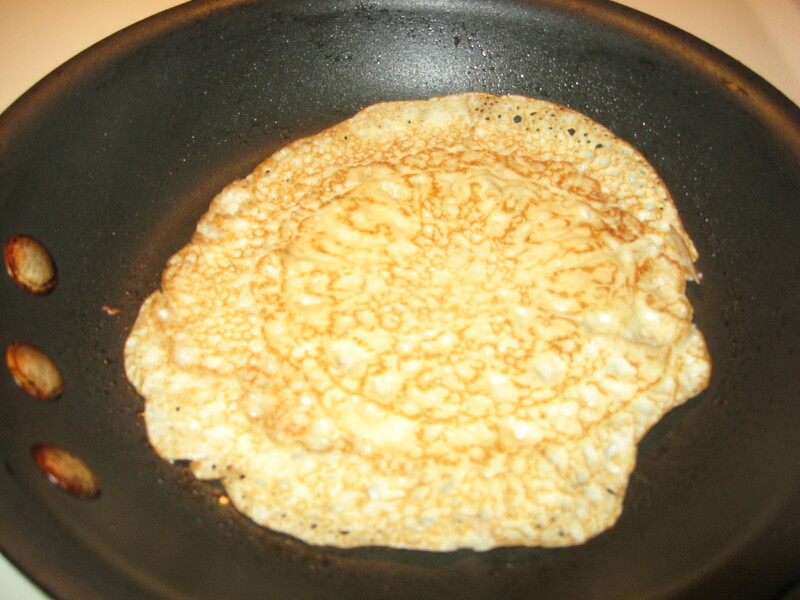 Then reverse the crepe to lightly brown the other side—about 15 or 20 seconds. You don’t want the crepes to get too brown or crispy. At this point, I do what my Mother used to do—I have a double boiler with a little boiling water in the bottom part, the top already warm, and I place the crepes in the top. They stay very moist that way. However, you can also keep them warm in a warmed oven. Fill and roll your crepe with your preferred filling and topping and bon appetite. If you have left over batter, you can store it in the frig. and use it on the morrow, however, I prefer it on the today basis. 1. Chopped apples & currents that have been browned slightly in a bit of butter and honey and when carmelized (about 3 minutes or so) a bit of rum thrown on. You can use any kind of fruit to do this-pears, bananas, berries, etc. You can also add some chopped nuts to this mixture or cinnamon. For a topping a little grated lemon rind is perfect. 2. Yogurt, sour crème, or crème cheese mixed with some sugar to sweeten with a brushing of sugar and cinnamon on top; or whipped cream, even ice cream and melted chocolate to top. 3. Jelly, jam, marmalade, or lemon curd with a sprinkle of powder or granulated sugar for the topping. This is the way mother always served it and my father loved it. When using cheese as a toping you can place the crepes on an oven proof dish and place in a 400 degree oven for about 10 minutes. 1. Cooked, drained, or sautéed chopped (except for the like of asparagus spears which fit in the crepe so nicely) veggies with a light white or béchamel sauce or various kinds of cheese slightly melted in the oven as a topping. Mushrooms are really good for a filling. 2. Meat (stewed), chicken, fish with a sauce topping. 3. Cooked beans with a cheese toping. 4. Ricotta cheese inside and an Italian tomato sauce on the exterior and baked a bit in the oven.